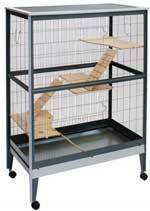 Single room cage with slides and natural wood shelves. 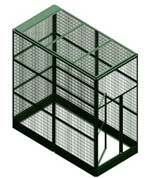 Rectangular Damo cage with frame and net entirely made of metal (no plastic). 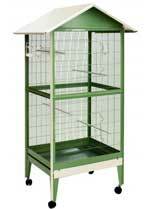 High, slender, generous in size, but at the same time compact and manageable cage. Here is the right solution for you and your pets. It is equipped with shaped shelves and ladders of European origin wood to entertain your friends moving in total safety in the large space at their disposal. The slide-lock system made of bayonet joints and the double plate to fix the wheels ensure great structural solidity that makes every movement fast and safe. The double anti-cut crease prevents accidental injury while handling the product. The refined design in pastel colors makes it perfect in any indoor environment while the total construction in galvanized sheet makes it also suitable for outdoor environments ensuring durability and strength. Quick and easy cleaning and maintenance are guaranteed by our slide-fall system that allows dirt to slip into the removable drawer to avoid annoying encrustations. 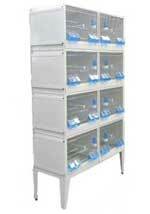 The large roof hatch facilitates the movement of rodents when needed. 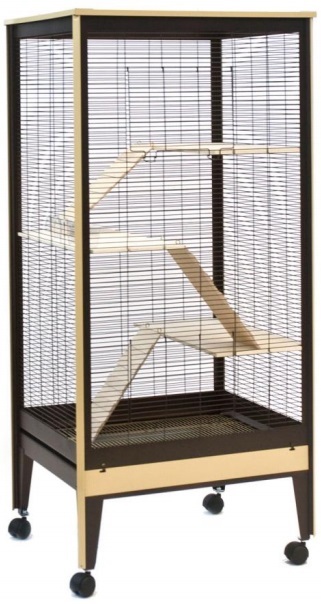 This cage is sold complete with all the accessories necessary for the life and well-being of its guests.